Michael Hyatt confessed that he wouldn’t have been able to build a multi-million-dollar business if not for his email list. Here are more examples. Jason Zook generated $80,000 from his book before he wrote a single page of the book, thanks to email lists. In fact, he had a small email list, yet he sold $80,000 worth of books. 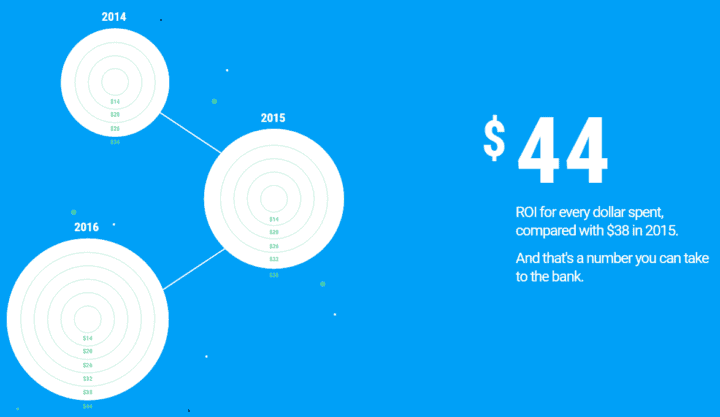 And SeeWhy studied a sampling of 60,000 e-commerce transactions across a variety of sites. 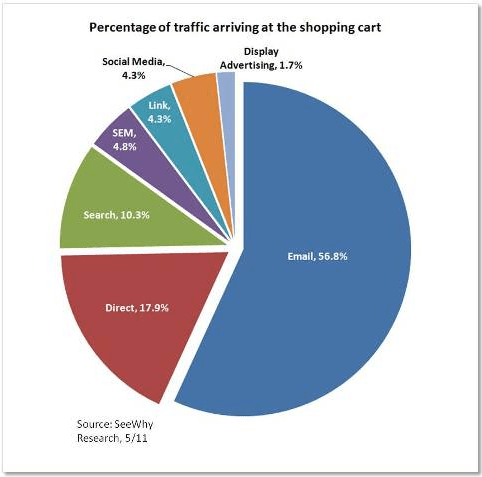 They tracked where the majority of their traffic who loaded items into their shopping cart was coming from. And guess what? 56.8% came from email. The study is quite old but still a good indicator. You’ll often hear internet marketers say “The money is in the list.” When you have a list of dedicated fans, you can always sell anything to them as long as the product is relevant and it solves their problems. So, now that you know the money is in the list, how can you build yours? There are six steps you can take to build a massive list of raving fans. 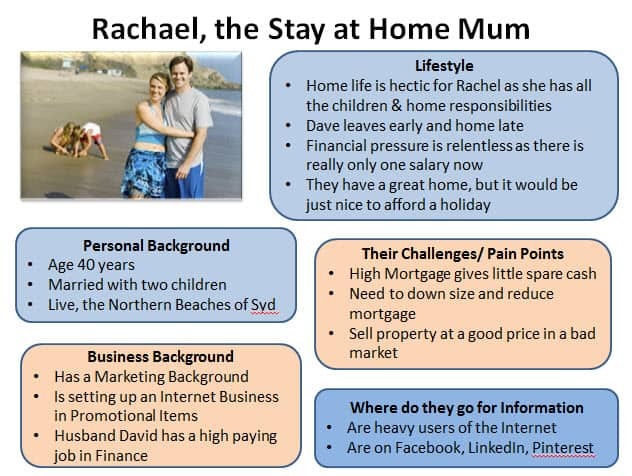 Using a buyer personas is crucial to your marketing success online and offline. Anywhere the eye can see, it’s likely to see an ad. People are being exposed to at least 3,000 marketing messages per day. When you create a buyer persona and use it, many people who land on your site would be eager to give you their email addresses. And they’ll be looking forward to receiving emails from you, because your messages will resonate well with them. HubSpot has created an extensive guide that will teach you how to create the perfect buyer persona. Keep in mind that your buyer persona is the foundation of your marketing which is why I strongly advise you to create it first. Blogging is one of the most powerful internet marketing channels available. According to a study conducted by HubSpot, marketers who have prioritized blogging are 13x more likely to enjoy a positive ROI. Businesses who have prioritized blogging receives, at least, 55% more visitors, 97 inbound links and have 434% more indexed pages on search engines. While your primary goal isn’t to have more visitors, inbound links, and indexed pages on search engines, all these are needed to achieve your goal of building a vast email list. These advantages help you build a successful business online. You need more visitors to your website to build a massive email list. Blogging gets you more visitors. You need more inbound links to rank on search engines. 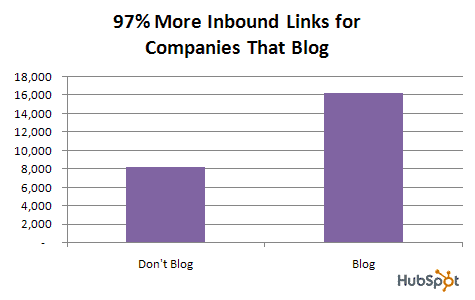 Blogging helps you get more inbound links. You also need more pages to collect more emails. 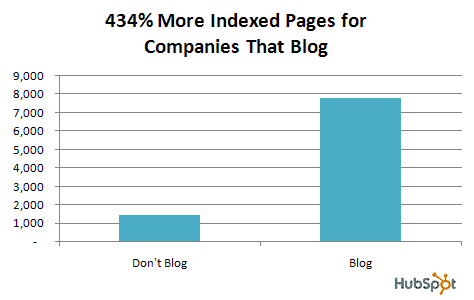 Blogging helps you create more indexed pages. So you see why you shouldn’t ignore blogging in your marketing strategy. The good news is the only thing that blogging costs is your time. If you have the time to blog, then you’ll be on your way to building a massive email list that makes you a lot of money. Quality content is the phase where you’ll need the buyer persona you created earlier. You should create content based on the information in your persona. That’s what helps you draw in the right people who would be willing to give you their emails. Now, I’m not here to tell you that content is king. The truth is, high-quality content backed by a solid promotion strategy is the KING. 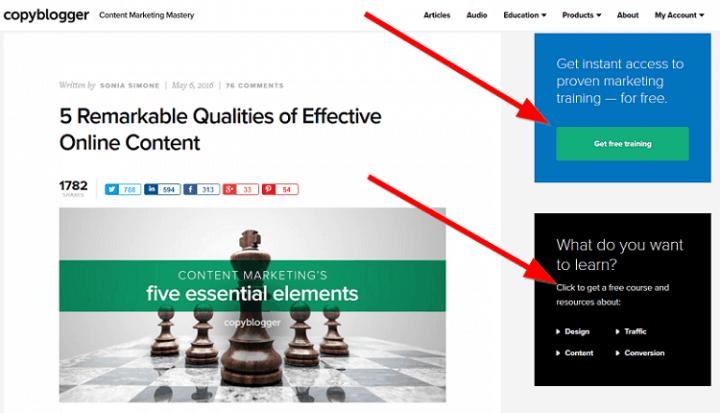 So, what is a high-quality content? In simple words, high-quality content is any web content that blows out everything your competitors have created on the same topic. 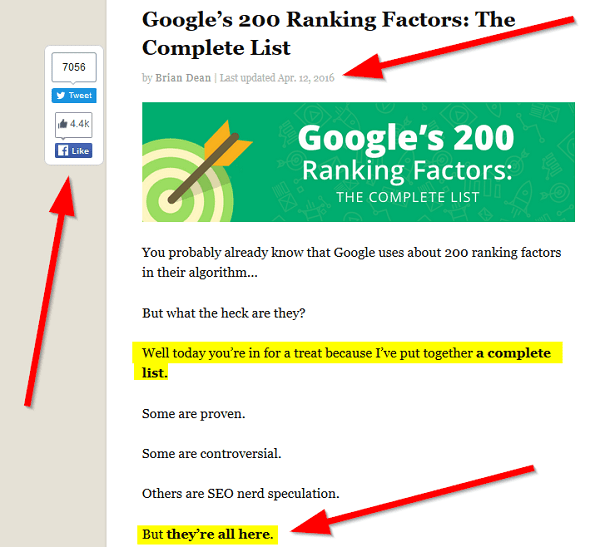 For example, when Brian Dean created his epic “Google’s Ranking Factors,” he went the extra mile to ensure that his article beats competitors from every angle. Looking at the upper-left side of the page, you’ll see that the page has amassed over 7,000 tweets and 4,400 Facebook shares so far. You should follow the same blueprint when creating high-quality content on your blog. 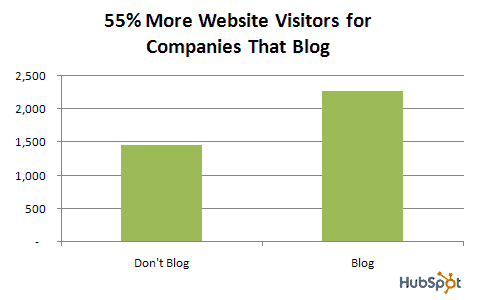 Average content can’t bring a lot of visitors to your blog. You need content that has the power to generate hundreds or thousands of visits every month for many years to come. Only high-quality content can do that. It will help you rank in search engines, naturally attracting high-quality inbound links that will help you rank even further. It also builds trust, credibility, and authority with your audience. The definition of “high-quality” changes depending on the niche, industry, type, or target audience. Let’s assume you have a piece of content in mind about “How to tie a tie,” all you have to do is search what your competitors have. After you do that, you’ll look for ways to make your content more interesting, entertaining and educating. When you consistently publish high-quality content on your blog, you’ll begin to see a lot of visits on a daily basis which helps you collect more emails. Note that this step is very crucial when trying to build an email list that makes you hundreds of thousands of dollars per month. Do this right, and you’ll have a dependable business on the web. 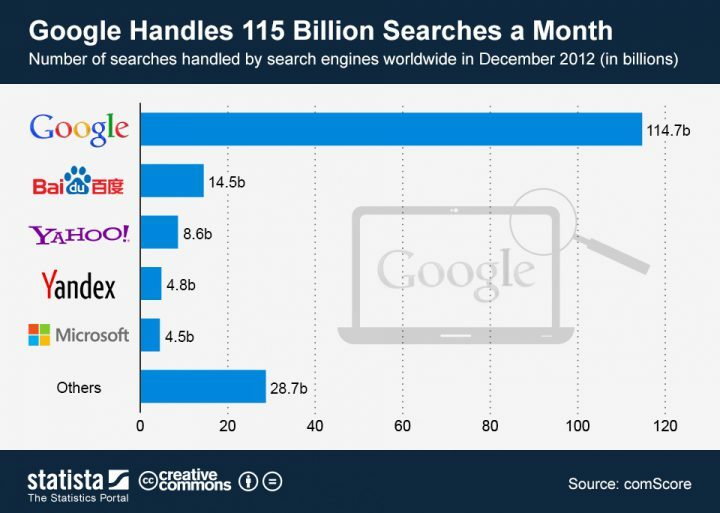 Google handles over 100 billion searches per month. Don’t forget that we also have Bing and Yahoo! who receive billions of searches, too. You should be getting your share of this huge organic search traffic, but you’ll have to optimize your site for search engines. As you already know, search engines have the power to send you thousands of visits per month. In fact, if you optimize for the proper keywords, a single page on your website could be receiving over thousands of visitors from search engines on a monthly basis. Massive traffic is why you can’t ignore SEO. While it takes time before you start seeing results, the outcome would be worth the effort. 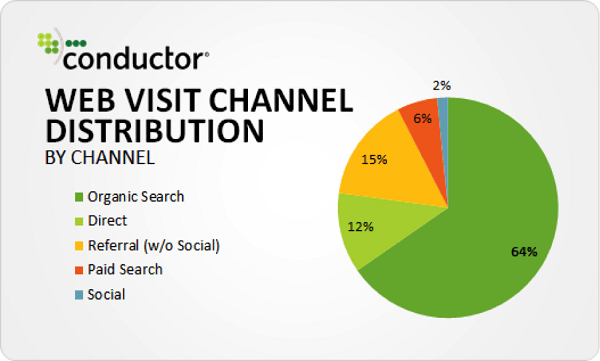 According to a study by Conductor, 64% of traffic to a website comes from organic search. SEO traffic is free. You don’t pay a penny to Google. And don’t even think about paid advertising when you consider the fact that 90% of digital marketing is spent on paid media, and only 6% of online traffic comes from it. 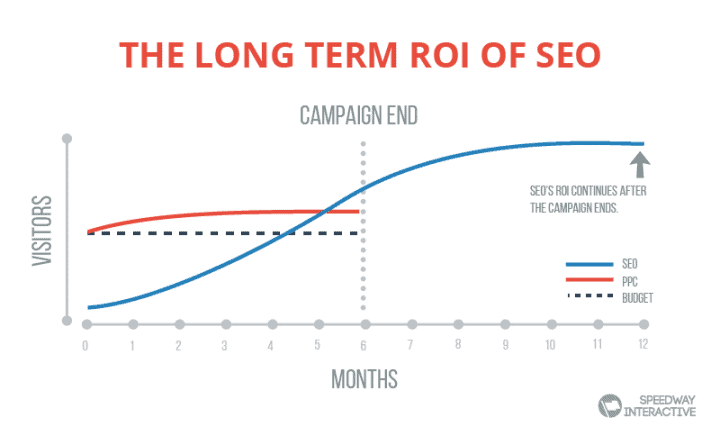 SEO is better because it generates visitors over the long-term, even after you’ve stopped investing in it. 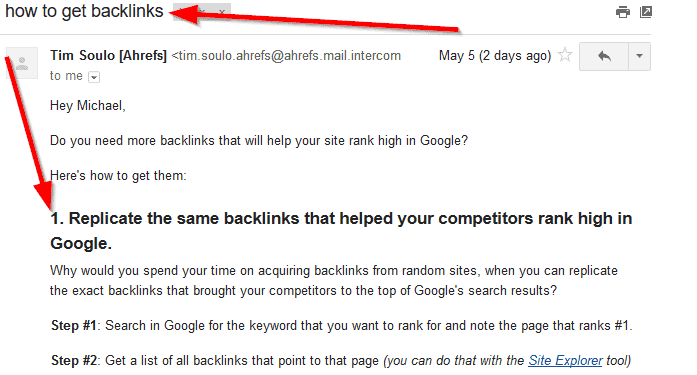 I believe you now know why SEO is effective and why you shouldn’t ignore it when building your email list. After you’ve done all the above steps, you should begin seeing some decent traffic on your website. You’ll see visitors browsing through your high-quality content. It’s time to convert those visitors into email subscribers. Can you just put an opt-in form that asks visitors to join your email list? Nope! It doesn’t work like that. You’ll have to entice those visitors with something that would make them want to join your email list. You have to create a special offer they can’t resist. After creating this special offer, you should give it away to anyone who subscribes for FREE! Let’s see how top marketing businesses are using free offers to build their email lists. 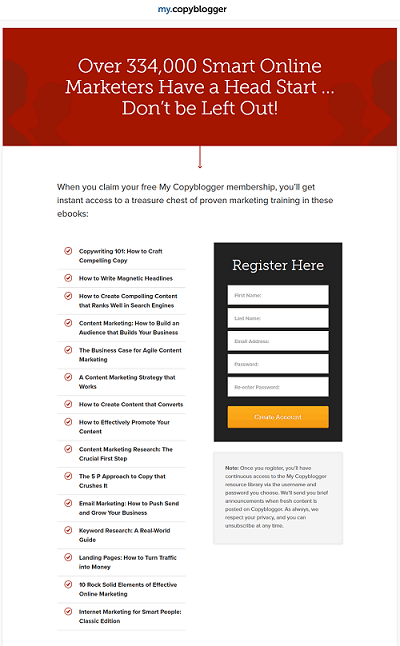 As you can see, Copyblogger does nothing but collects emails on this page. That’s how they’ve managed to build over 334,000 email subscribers over the years. 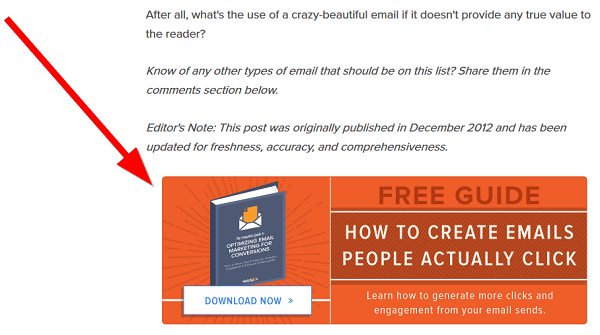 HubSpot does also a great job at offering relevant free ebooks at the end of every blog post on the HubSpot blog. No wonder they’ve been able to build an email list of over 300,000 subscribers on their marketing blog alone. You can follow the footsteps of popular marketing websites like Copyblogger and HubSpot to build your email list. After you begin seeing some subscribers on your email list, the real work is just starting. You’re not building your email list just to have a lot of email addresses. You’re doing it, so that you can be able to sell to them over and over again. Thus, you must develop a strong relationship with the people on your email list. You develop a strong relationship with your email subscribers through showing up in their inbox on a consistent basis. Note that I don’t mean you should be sending them emails every day and night. What I mean is you should think of them as you think of your closest relationships such as your friends and family. You should send them regular messages. It could be once or twice a week. Looking at the screenshot, you can see that this email is very relevant to me. When you have a big list of email subscribers by following the steps above, and you develop a strong relationship with them, you can always sell to them whenever you want. BIO Michael Akinlaby is a freelance writer and SEO Consultant. Michael is the founder of RankRain, an internet marketing agency that specializes in Content Marketing And Search Engine Optimization. 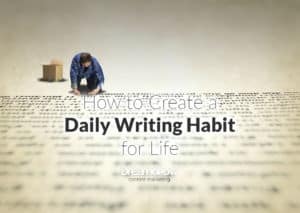 This is such a great article — so full of useful tips! Email popup still remains the most effective way to present the signup form. You don’t have to take over the whole viewable area but make it stand out.